One World Language is an academy that provides high quality language instruction for adults. We value personal human connections in education. Thus, our goal is to provide the best possible service to the Pangyo community that will help our students in their personal and professional lives. Our instruction methodology breaks the traditional model of rote memorization and lecturing, and focuses on stimulating high student interaction and engagement. In order to do this, our academy limits class sizes to provide as much teacher-student interaction as possible. Our classes are structured to be short, intense and frequent, to suit the busy schedules of working adults. Our experienced teachers offer classes ranging from beginning to advanced learners in Korean, Chinese, Spanish, Japanese and English languages. While our focus is in language education, through our specialized curriculum, including Global Topics and Media & Culture, One World hopes to inspire environmental and humanitarian consciousness. 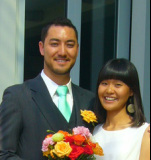 Brian and Sujin are a married couple who have both been teaching for over ten years. Brian is an American who came to Korea to teach and was a head instructor at an English academy in Seoul when he met Sujin in 2006. Soon after getting married in America in 2009, Brian completed his masters degree in the field of education at Seattle University. While living in Seattle, Sujin taught Korean Language at Seattle Pacific University and became a CELTA certified teacher. In 2010, they returned to Korea, where Brian taught English Language Arts at Seoul International School and Sujin began teaching both English and Korean at major corporations in Seoul. By 2013, Sujin's independent teaching business was growing rapidly, especially among corporations in Pangyo and the couple decided that it was time to open an office. As the founders of One World Language, Brian and Sujin wish to combine their experiences to build a unique and creative team of teachers who will provide language instruction that will enhance the lives of people in the Pangyo community.